For years my friend, Dr. Jim Loomis, Medical Director for the Physicians Committee for Responsible Medicine (PCRM), and I wanted to collaborate on a project and during a lunch meeting while he was in town, I told him it was time St. Louis to host a plant-based event. Since 2011 I have been educating our community on the health benefits of a plant-based diet and it was high time we invite the plant-based pioneering researchers and physicians to our great town to share their information with us. And that's just what we did. On Saturday, July 14, 2018, the Plant-based Nutrition Summit unfolded in incredibly eloquent fashion to a sold out crowd at the prestigious Washington University. Thank you to all involved who helped us put St. Louis on the plant-based map! 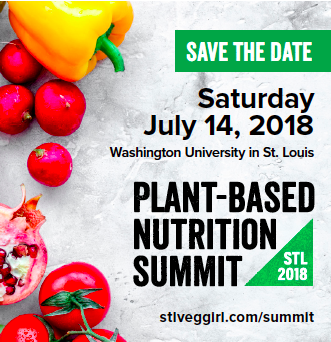 St. Louis, MO (May 30, 2018): St. Louis’ first Plant-based Nutrition Summit will take place at Washington University on Saturday, July 14. Featuring world renowned experts on plant-based nutrition, the Summit will educate the public on the heath benefits of a plant-centric diet.